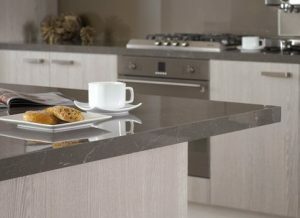 Home > Resources > Videos > Laminate Benchtops with Professional Joins. Laminate Benchtops with Professional Joins. 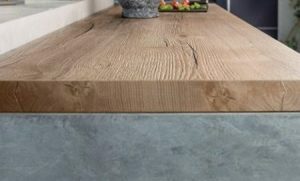 If you’re after a hard-wearing benchtop at the right price for your project than you simply you can’t look past a laminated benchtop. There are several advantages to using laminate for your kitchen benchtop. It is cheaper than many other materials commonly used and is available in a huge range of colours & styles. Modern-day laminate ranges are attractive and warm and easily replicate other materials such as natural stone or timber. If you choose a high-pressure laminate for your benchtop, it will be easy to clean and it will also resist scratching and staining. Although stone benchtops are very topical in Australian renovations, they are not always the best choice for every project. Modern laminate choices mean a benchtop range that is virtually unlimited in colour, finish and now texture…(via woodgrain embossing). The exceptional colour depth and clarity that is available through modern laminates is akin to natural materials and can offer some distinct design advantages for the savvy renovator. impermeability of this surface means that they require no more than wiping with a soft cloth, dampened with plain water or a household detergent mix to remove all common household spills. Laminate Benchtops should be cleaned by wiping down with a white damp soft cloth and warm soapy water. For more stubborn stains use a mild household cleaning spray. Always ensure you refer to the recommendations provided by the manufacturer of the cleaning product before use. By following these simple steps you should retain a beautiful kitchen surface for many years.